I work as an instructional designer at Kent State University in The Office of Continuing and Distance Education (OCDE). In my department, we offer faculty presentations, workshops, and short courses on subjects such as accessibility, building online courses, and course design. These offerings, designed by experts in the field, provide faculty with a toolbox of ideas and strategies to use in the online classroom. In the past, Kent faculty received a certificate of completion for these events. The certificates were often used by faculty seeking tenure to showcase their efforts. However, certificates do not explain in detail what the participator can do as a result of the workshop. What skills or knowledge did the participant acquire? What did the participant do? Does the person have an artifact as a result of their participation? Get more tips! Subscribe to Connect Monthly to receive more content like this in your inbox. Open digital badges were designed to showcase skills and accomplishments. Similar forms of rewards have been around for centuries in the form of ribbons, arm badges, and buttons. This concept has been digitalized in small icons, called badges, and are used to showcase skills online. It is important to note that a digital badge is simply digital art unless it is open. 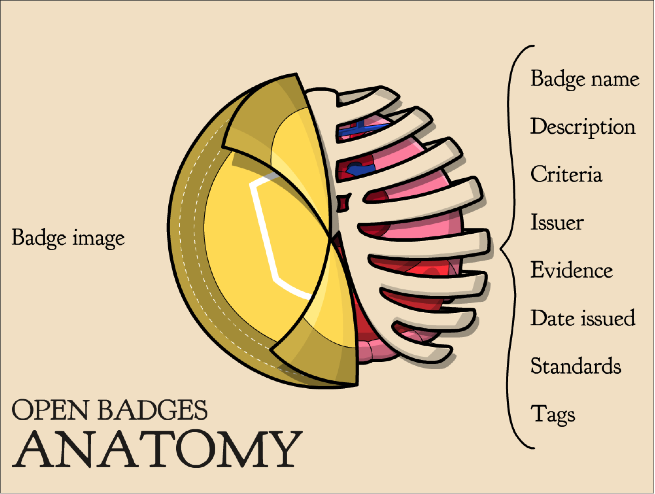 Open digital badges contain metadata. An open digital badge includes a description of the badge and includes the criteria for earning the badge. It also includes the issuer, the date issued, and may also include a link to evidence. This opens a whole new realm for professional development. Badges can be displayed in two types of systems: closed and open. A closed system exists behind some type of wall and does not allow for multiple issuers. For example, Khan Academy issues badges, but all badges are Khan Academy badges and may not be shared elsewhere. Closed system badges can’t be displayed in other locations, or the other locations or networks are under the purview of the issuing entity. Open systems showcase your badges in backpacks. A backpack in an open system can display badges from several issuers. An open system was important to our team at Kent, as we didn’t want to lock our earners down to badges delivered only from Kent. My personal backpack contains badges from Kent State, Blackboard, and the Badge Alliance, among others. At the time of this writing, the main open backpacks are Mozilla Open Badges, Credly, and Open Badge Factory. At this point, you may be wondering how badges get into your backpack (if you are a user) or how to put badges into backpacks (if you are an issuer.) The process of issuing badges varies with the capabilities of the issuing organization. The McArthur Foundation funded the open badge initiative, and all the code is free and available. Our department didn’t have coding personnel or a system to issue badges to Mozilla except through our learning management system (LMS), which is Blackboard. Since some of workshops are face-to-face, Blackboard was not a viable solution. We selected Credly because it offers the features we wanted, it is inexpensive, and it is easy to use. An organization that has coders or has the funds to hire coders may want to dig deeper into Mozilla or look into Open Badge Factory. This is how to create and issue a badge with Credly in three steps. Upload your digital art. Although Credly has a badge builder to create artwork, I do not recommend this, as badges are visual representations of your company, and Credly’s badge system is very basic. Use a graphic designer to create professional badges. Once your art is uploaded, add a description that details what the badge is and what the user had to do to earn it. This is the most important part of a digital badge. If their participation was simply to attend a presentation, note that. If they had to do something spectacular and was expert accessed, note that. If they had to create an artifact, link to it. As issuers, it is important to understand how your system will work and provide instructions for users on how to accept their badge. If your organization uses Credly to issue badges, you may use and modify the document we use at Kent. Be sure to email your users prior to awarding badges. It’s best to discover incorrect email address before awarding a badge to the wrong address. For your convenience, the letter we use at Kent can be found here. Providing step by step videos can be a nice touch as well. These videos can get you started on badge basics and sharing badges. One of the best features of badges is how easily they can be shared. If you are a pro issuer for Credly ($250 per year), your users can showcase their achievements on Twitter, LinkedIn, Facebook, and Mozilla, or provide their own custom URL. Now, when Kent State faculty attend our workshops, they can provide the tenure committee with the URL of their badges. Badges in a Mozilla backpack can be shared with Credly and vice versa. Digital badges are ideal for professional development. An open backpack is a great place for individuals to showcase their accomplishments, both inside and outside an organization. At Kent, my goal is to see badges would then reside in open backpacks with badges received from other issuers. I hope you will start a badge program at your organization. If you do, and need more help, feel free to email me. I would be delighted to video-conference a presentation on badges to your team. All I want in return is a badge. MaryAnne Nestor is an instructional designer in the Office of Continuing and Distance Education at Kent State University. She is a badge evangelist and assists organizations with incorporating badges by teaching the basics of digital badges and providing hands-on assistance with tools to make their badge program a success. One of the tools she uses to promote badges at Kent State was featured last June by EDUCAUSE.